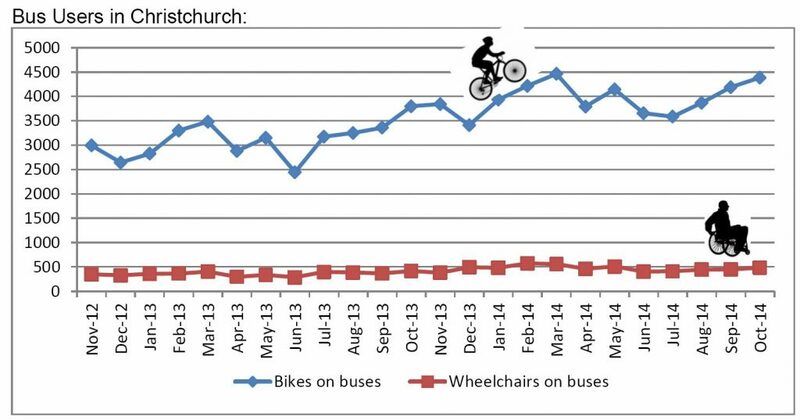 As many of you will have heard, various changes were made to Christchurch bus services in December. For example, we now have a network of high-frequency “orange/purple/yellow/blue line” services across the city. 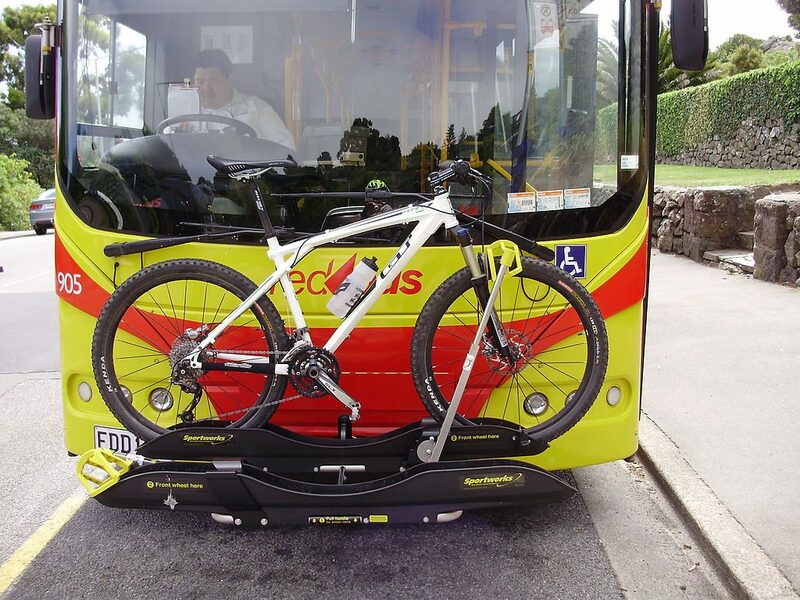 One relatively unheralded outcome of the new bus services is that we also now have 100% coverage of bike racks on buses around town (plus you can take them on the Diamond Harbour Ferry). Bike use on buses continues to grow around the city; I quite regularly see the racks in use. Environment Canterbury monitor the usage; a while ago we presented some of the initial statistics, and below you can see the most recent data up to last October (from the Regional Trpt Committee). Typically now the city is averaging ~120-150 bike rack uses a day, so it’s providing a small but valuable service to our transport system (interesting too to contrast usage with wheelchair users, who had wheelchair-accessible buses available for about a decade before bike racks showed up…). With the new bus services in place it works out that, in the peak hours, nearly 200 bike racks per hour are available for use across the network, so there’s a fair bit of spare capacity. Of course, some of the more popular routes (e.g. through Lyttelton Tunnel) are quite likely to be over-subscribed more often, and that is a problem. 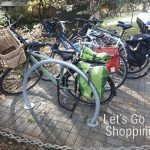 It is possible to get triple bike racks, which increases the capacity somewhat, and I think that ECan are looking into that for the busiest services. Alternatively, maybe in the near future, you’ll be able to park your bike at the bus stop and then pick up a public share-bike at the other end? Using the bike racks is free with your bus or ferry fare and pretty easy to use. If you’re a bit worried about trying it out for the first time in a “live” situation, we’re hoping to bring you a chance to “have a play” at the “CAN Do” cycling advocacy workshop here in late March (more details about that to come later). Hopefully we will also get a wall-mounted “practice” rack installed at the new transport interchange when that opens in a few months too. Have you taken your bike on a bus?